KataSpace is an example application built with Sirikata. 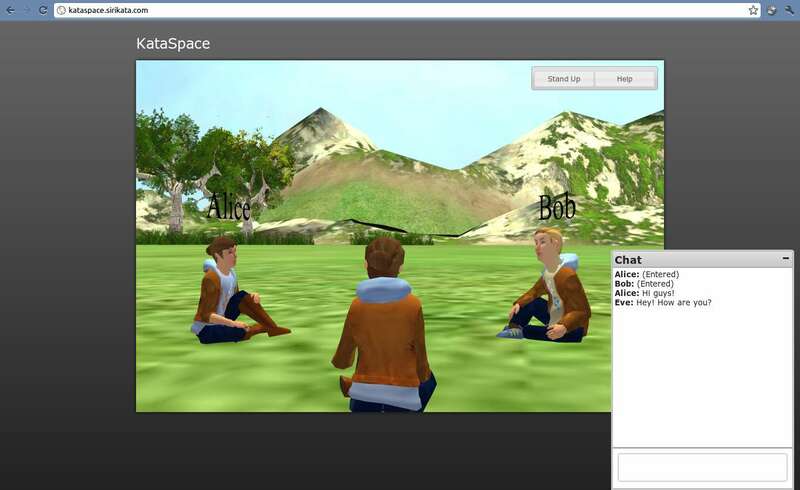 Users join the world as an avatar and can chat with each other. Sirikata is a BSD-licensed platform for virtual world applications. Virtual worlds are shared, online, 3D, interactive spaces. They have a lot of applications – from games and entertainment, to education, to social applications. Sirikata makes creating virtual worlds easy. Sirikata provides all the tools for creating a virtual world, but it isn’t a single world that you can log into. Instead, you use Sirikata to create your own world or an application in a Sirikata-based world. While application developers might be end-users, generally this guide is not for end-users. The world developer is responsible for providing documentation for them since Sirikata is highly customizable – clients for different worlds may look different, respond differently to interaction, and permit different actions in the world. Both types of users should start out by understanding the Sirikata Architecture: you need to understand the components of the system at a high level and how they work together to create the world before you can understand how to setup a world or build within a world. Application developers should proceed to the Introduction for Application Developers, and will likely want to begin with the Emerson Tutorials. World developers should then read about the The Sirikata Ecosystem to understand their options when constructing a world and then proceed to the Introduction for World Developers. For a complete list of available documentation, see the Table of Contents. Or Search Page for a particular topic. Found a bug and want to try fixing it? Need functionality that isn’t built into Sirikata? If you want to dig into the Sirikata platform code (rather than building on it), check out the Introduction for Platform Developers. © Copyright 2011, Sirikata Authors. Created using Sphinx 1.1.3.